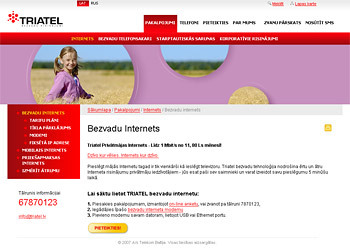 TRIATEL is a telecommunications company offering the most contemporary wireless communications solutions – wireless Internet, mobile and fixed line communications. The most important task of the website is to inform visitors about all products and solutions that TRIATEL offers and to ensure easy and quick application process for the services. In the process of creating website's new version a large amount of information and interactive possibilities were reimplemented in a more perceivable way. For this reason the structure of homepage was revised and made simple and logical, making the content of the page easily accessible and understandable. Dynamic and eye-catching solution was created for the design of the site and the solution for advertising banners, while still retaining fast loading speed. The corporate red, combined with white background and minimal accents of other bright colors in each section, make the visit of the website pleasing and interesting.